Beautiful waterfalls at the Plitvice Lakes National Park, Central Croatia. 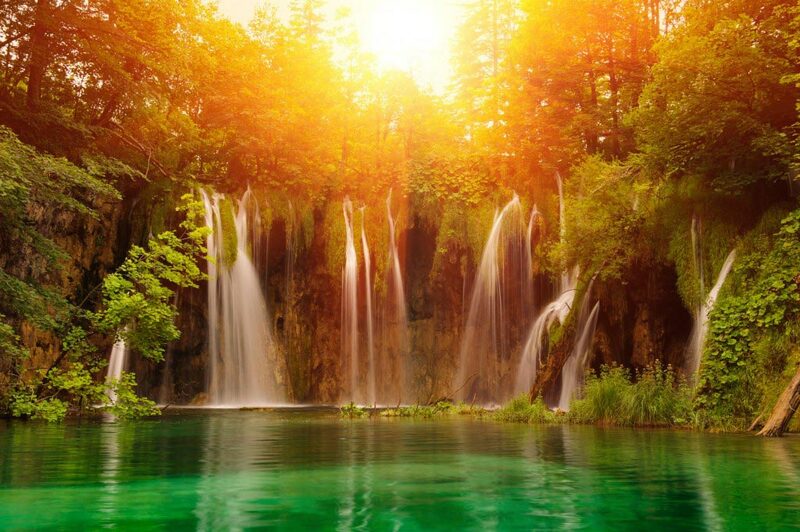 Plitvice Lakes National Park in Croatia is known for its natural beauty, including waterfalls, caves, and lakes. The park is characterized by karst topography – landforms made from the erosion of soft rocks, in this case, limestone, chalk, and travertine. The lakes were created by the collapsing, crumbling stone, which formed natural dams. There are 16 lakes, divided into 12 upper lakes and 4 lower lakes, and about 8 kilometers (5 miles) of walking or hiking trails around the wooded forests. The beautiful scenery at Plitvice is enhanced by the varied colors of the water. The lakes at the park range from gray to green to numerous shades of blue, depending on the sunlight and the minerals in each pool. In total, about 5 square kilometers (2 square miles) of the park is covered with lakes. The park’s most notable waterfall is the Veliki Splat, which falls from a height of over 30 meters (100 feet). Some of the great mountain peaks include Gornja Pljesevica peak (1,640 meters/5380 feet), Seliski Vrh peak (1,280 meters/4199 feet), and Medvedak(884 meters/2900 feet). Plitvice Lakes National Park is home to a variety of plant life, with forests of beech, fir, pine, hornbeam, spruce, sumac, heather, as well as hydrophilic plants like reeds and gray ivy. The park is a natural habitat for bears, wolves, other animals including frogs and fish, as well as 126 species of birds. Plitvice Lakes National Park serves as a breeding ground for 70 species of bird. The park is also a historic site, known for 1991 tragedies at the outbreak of the Croatian War of Independence. The region was the site of one of the first battles, which caused damage to the sites and the death of many civilians by the Yugoslav Army. It is also an archaeological site, with evidence of tribes dating back to 1000 BC, the prehistoric Japuds. Archaeologists have found prehistoric settlement, tools and ceramic artifacts from the Bronze Age. Today about 4,000 people live around the park. The park was declared public lands in 1949, made a UNESCO site in 1979, in one of the first groups of natural sites to be added. Plitvice is the oldest national park in the entire region of Southeastern Europe, and the first and largest national park in Croatia. The park has an area of 296.85 square kilometers (114.6 square miles). Plitvice Lakes National Park receives over 1.2 million annual visitors. In 1998, the park was declared a mine-free zone by UNESCO – it had previously been considered an endangered site. Where is Plitvice Lakes National Park? Plitvice Lakes National Park is located in central Croatia near the border to Bosnia and Herzegovina. The park is situated in the mountains of Lika-Seni county, making it great for hiking. To get to Plitvice Lakes National Park, there are a few options. 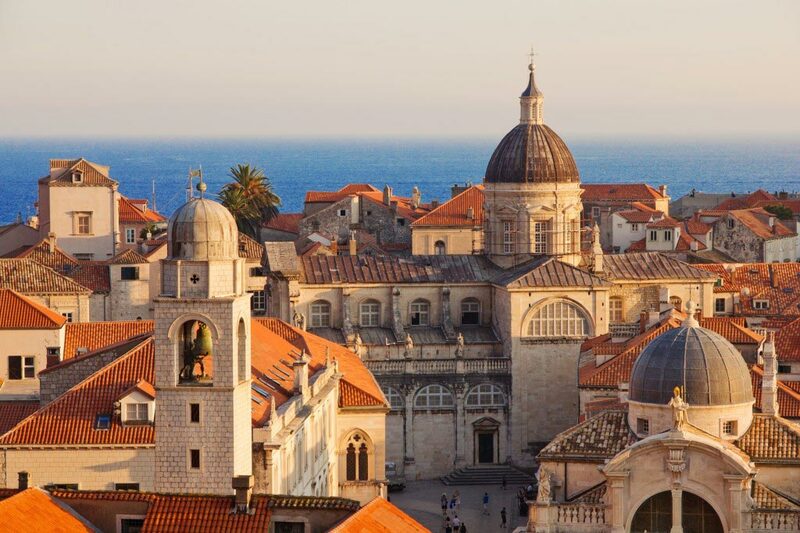 Buses are available to and from Zagreb, Zadar, Split, and Bihac, Bosnia (from the nearby Grabovac). Taxis from some cities are another option. One of the most convenient options is renting a car and driving from one of the major cities. However, Parking at the park is not free and costs about 7 kuna per hour. The park is open year-round, but the best season to visit largely depends on what type of trip the vacationers are seeking. For beautiful weather, great hiking, and the best time to see the waterfalls is spring. Average temperatures in June are around 15.6 °C (60 °F). It rains frequently in the park, especially from April to June. A few events take place at the park each year. Both International Day of Biodiversity and Nature Protection Day celebrations take place on May 22, and the park hosts activities promoting conservation and biodiversity and the importance of sustainability. Plitvice also celebrates European Day of Parks on May 24 each year. Alternatively, winter can be a great time to visit Plitvice Lakes National Park – which offers plenty of snow and all the outdoor activities that go along with it. As for temperatures, January is the coldest, with an average minimum temperature of -5.3 °C (22 °F). Hiking is limited during this season, and the park closes during severe winter storms.